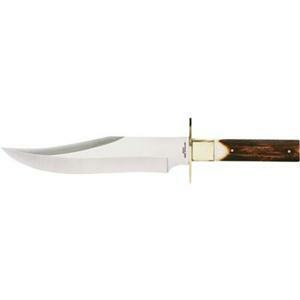 The Coast Grandpa knife -- made by Coast Knives of Portland, Oregon, but designed by Zweibruder (Puma Knives) -- shows the classic American Bowie pattern as influenced by European weapon smiths. More a piercing weapon than a chopping blade, the upswept point and false dagger edge would be at home on a European battlefield. In America, things just got a little bigger -- the Grandpa Stag Bone Bowie is nearly 12-3/4 inches long overall with a blade a full 8-1/2 inches in length. Some weight has been shed compared to heavier and older Bowie styles, but the blade stock of nearly one-quarter-inch thickness and the full-width, full tang handle construction still qualify this as a heavy blade. The knife has a simple frontier look with a straight finger guard and double pinned stag bone handle, but the beautifully curved blade and the wide brass bolster give this Bowie a classic look. For hunters who really do hunt big game, this knife in 440C German high carbon stainless steel could be a good dependable hunting and skinning knife. The blade's shaped well for piercing and is certainly heavy enough to pry apart joints, chop through bone, and still do the delicate work of skinning and butchering game. Most hikers will find this knife too much for the trail, but if you spend a lot of time in the north country hunting for larger game than squirrel and quail, the Coast Grandpa could be just about right. It's a good knife without the fancy decorations that came along later. You can still see the essentials of the frontier in this one.